Want your AR-15 to be the best it can be? We’ve built dozens of AR’s and we’ll cover all the best AR-15 upgrades such as handguards, triggers, BCGs, gas blocks, and more. Plus, there’s individual hands-on articles for each part…so get ready to go down the rabbit hole! 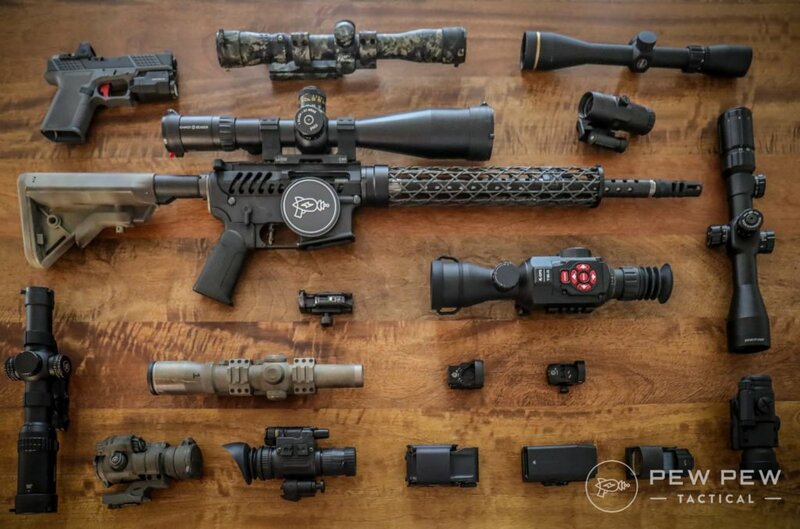 After you get some time with a more basic AR, you’ll likely start to realize could be improved to meet your specific purpose. 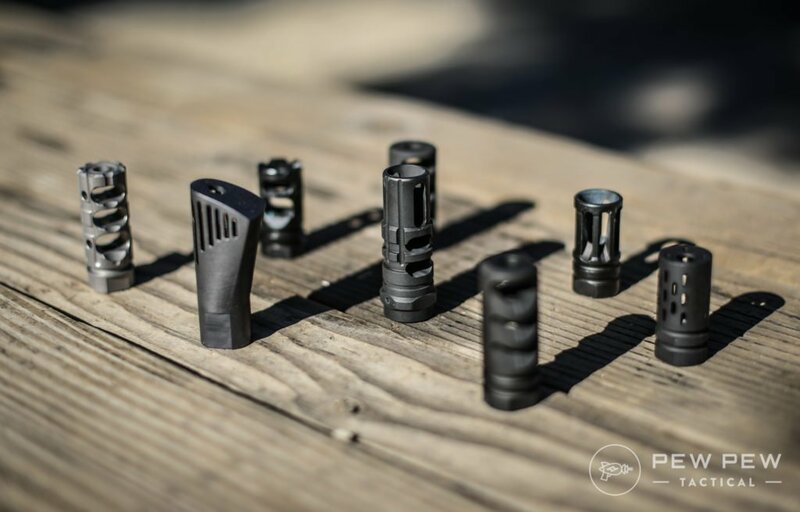 And the AR-15 modular system makes upgrading a breeze for most components. We’ll start off first with possible upgrades to the upper receiver group followed by the lower receiver group and furniture. We’ll also provide examples of what we think are the best in class for each type of upgrade. Don’t have an AR yet? 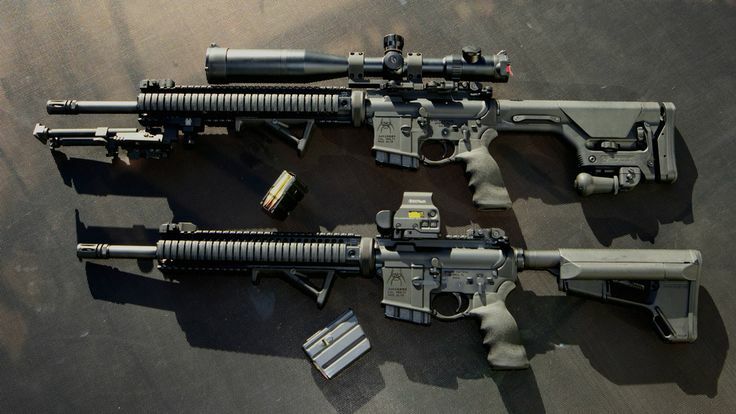 Check out our Buyer’s Guide to the AR-15 first. Brakes, compensators, and their hybrids are a super easy upgrade to help you reduce felt recoil and minimize vertical movement of your gun. 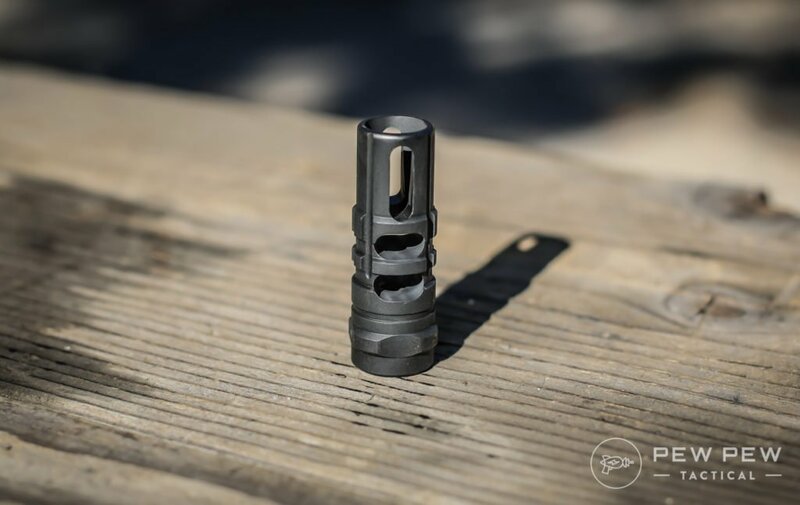 We cover a bunch of the best and most popular ones in our Best AR-15 Muzzle Brakes article…but here are our favorites. The Precision Armament M4-72 Severe Duty is one of the best recoil reducing brakes…plus it had the least reticle movement after firing. It barely moves! But beware…it is really loud and will annoy people next to you. Still…it’s the most effective. The Best Hybrid Brake/Compensator goes to the VG6 Gamma. It’s less punishing to your range friends but is also great at recoil reduction and limiting reticle movement. 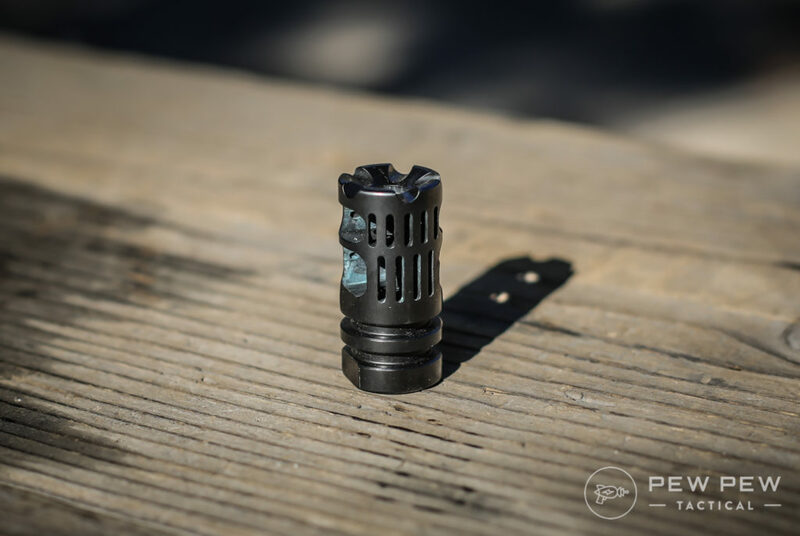 And our Goldilocks Muzzle Device goes to the Strike Industries J-Comp V2. It’s great at recoil reduction…might have some flash-hiding capabilities…and definitely has very little reticle movement. Oh…and it’s around $30-40 only. Again…see the rest of all the tests (along with more videos of side blasts and live fire) at Best AR-15 Muzzle Brakes. In our original How to Choose Your AR article, we recommended sticking with the stock Mil-Spec (military specification) trigger and letting it smooth out with use. We still advise that with critical use AR’s such as home/self defense. As you go with “better” triggers, you’re skirting the line between performance and reliability. And with some guns, you want to make sure they will always go bang. For others such as range plinking, competition, or precision shooting rigs, you care more about the crispness and lower trigger pull weight. 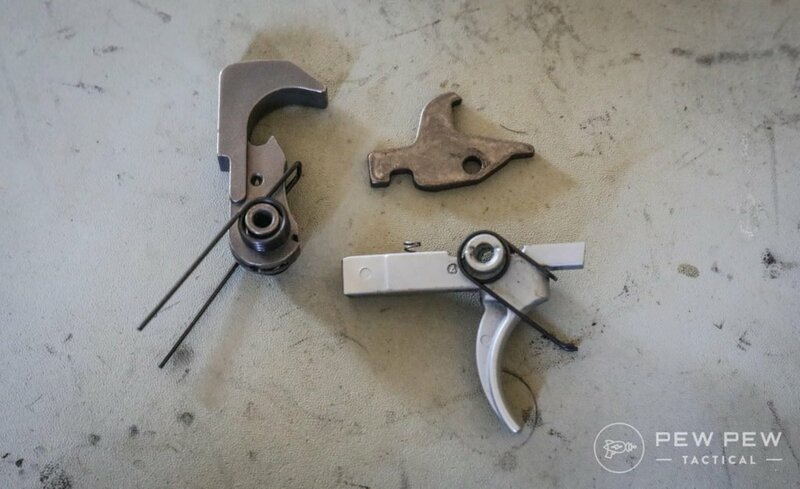 We’ll cover three varieties of aftermarket triggers: upgraded mil-spec, single stage, and two stage. 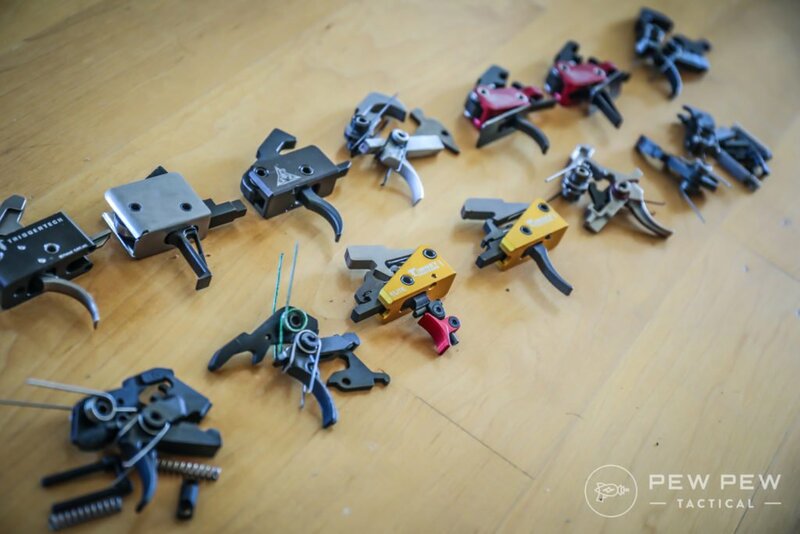 But also check out our complete Best AR-15 Triggers article for all our tested ones. These still maintain the same geometry as mil-spec stock triggers but are polished for a better feel. They maintain the same reliability with slightly better pull weight and crispness. ALG Defense Trigger QMS: The go to brand for mil-spec reliability with some refinement at a 6.5 lbs trigger pull. 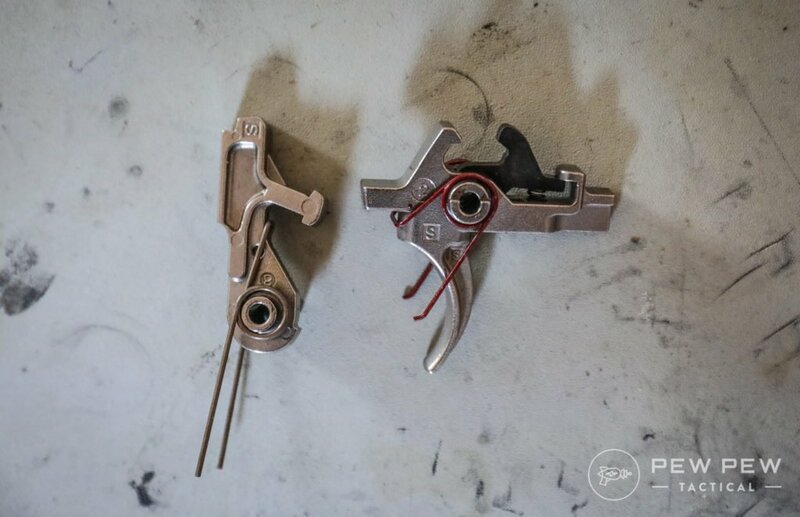 Summary: Polished and coated mil-spec trigger that gives a much better feeling with less creep and a cleaner break…but maintains reliability. This is one of our favorite (and easiest upgrades). What do you think of an upgraded AR trigger? 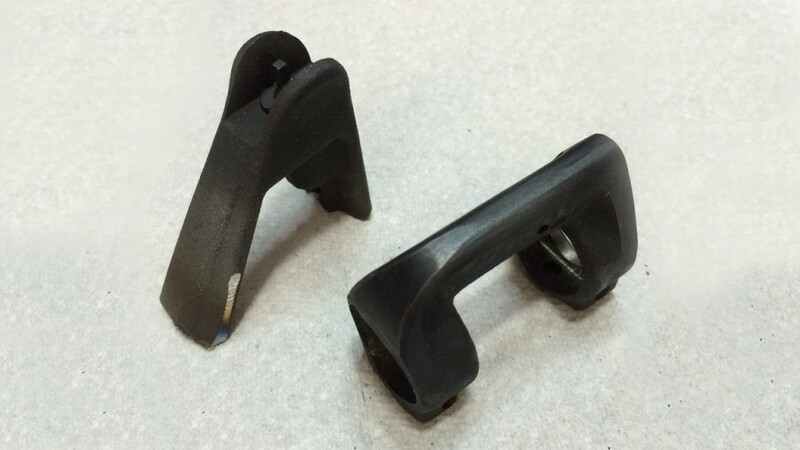 These are are very crisp triggers that move back in one movement with a lighter trigger pull. Rise Armament Super Sporting Trigger: The best bang-for-the-buck upgrade at under $100 for a drop-in single stage trigger that dramatically makes your AR-15 feel so much better. 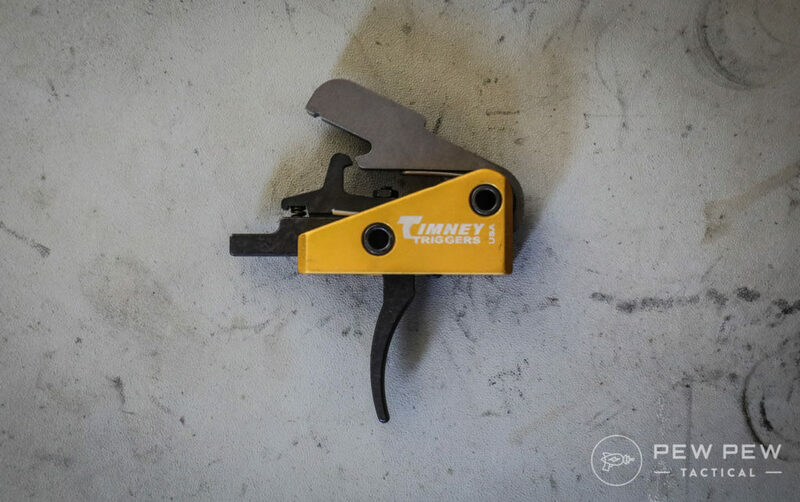 Timney Competition Trigger: A huge name in the AR-15 trigger world is Timney. And I love their Competition Trigger which comes in at 3.5 lbs of crisp goodness. Summary: Love the almost non-existent pre-travel combined with a clean break. 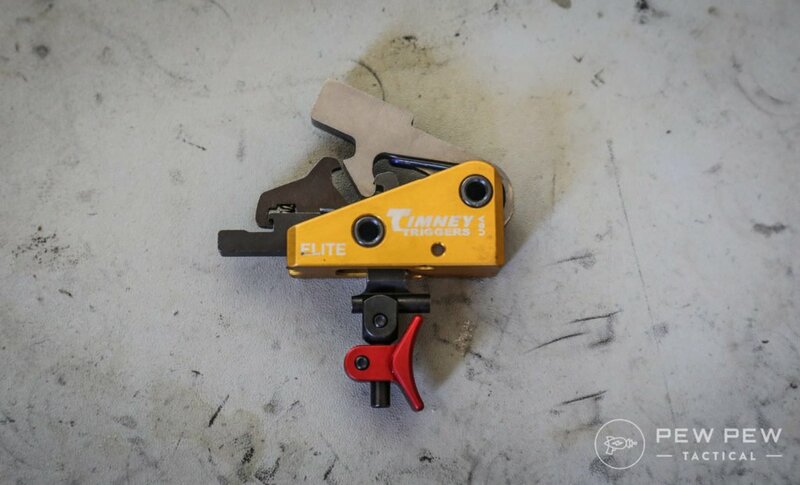 Timney Calvin Elite: If you want the absolute lightest trigger…you get the Calvin Elite which comes in at an astonishingly low 1.5 lb. Truly a hair trigger for you competition shooters out there. Summary: The lightest and fastest shooting for me…plus the most adjustable. I would make sure to Loctite all the adjustment screws since there’s a lot of potential for things to become loose. Still with us? Let’s move onto two stage triggers! 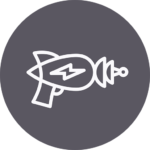 While single stage triggers require all the force to engage, these two-stage triggers allow you to take up most of the slack in the first stage before requiring just a little more pressure to fire on the second (about 1 pound). Thus, two stage triggers are normally reserved for precision rifles but when pressed quickly act just like single stage triggers. Geissele Two Stage Trigger: Super well-known name in the competition trigger world, especially for their two stage triggers. 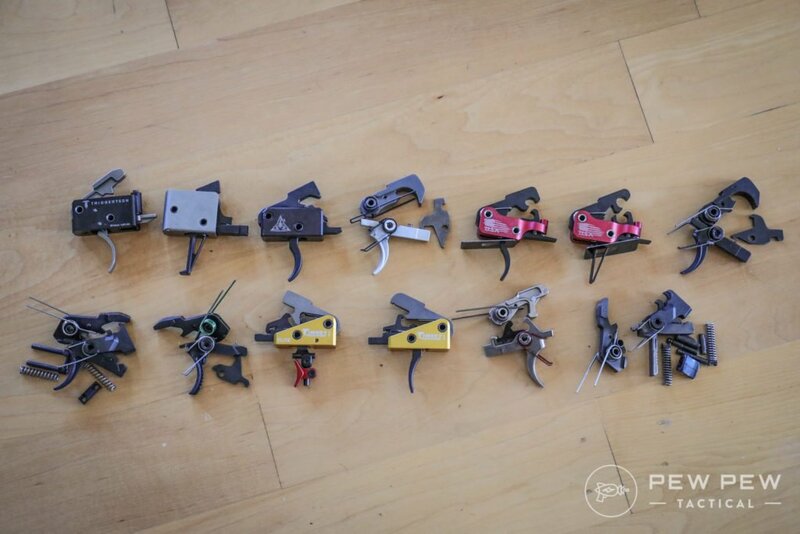 Good choice of types of triggers and different weights. $220-240. Also, check out their enhanced reliability ($180) models and a more budget model ($170). 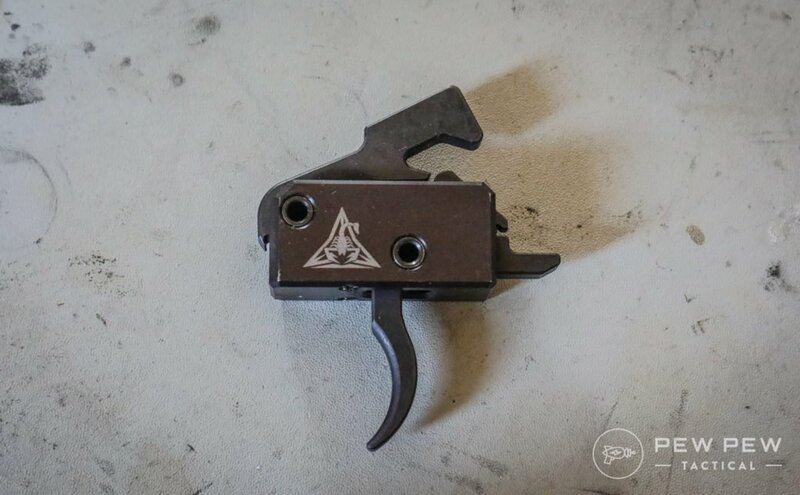 PSA Two Stage Trigger: For the more budget conscious…the PSA version is very similar to the Geissele and comes in at half the price. Summary: Great deal in the realm of 2-stage triggers if you don’t want to spring for the Triggertech or a Geiselle. I pair this up with my PSA AR-10 precision builds. 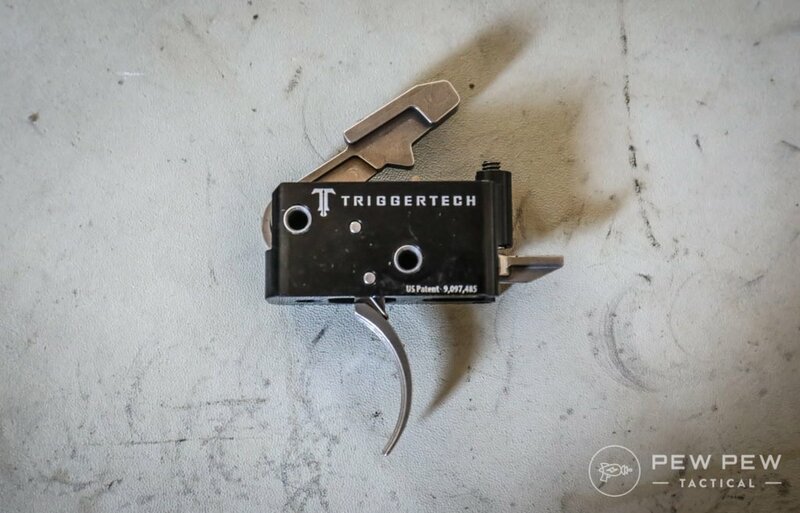 Triggertech Adaptable AR Trigger: A drop-in two stage trigger that’s weight adjustable and silky smooth. Summary: Very nice first stage that’s reminiscent of 1911s that leads to a clean light break and minimal over-travel. Good reset to end of first stage if you’re shooting slowly. Again…see all the triggers we tested in our Best AR-15 Triggers…complete with videos of us firing and split times. We’ll focus on two types of handguards, drop-in, and free float. 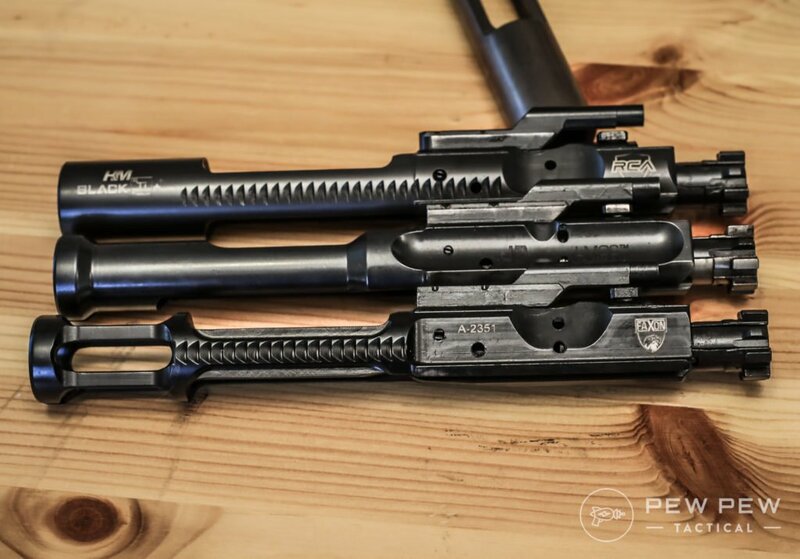 We cover this in much more depth in our Best AR-15 Handguards section. But here are our top selections. Drop-in handguards are when you have a delta ring on the receiver and a fixed front sight base. You’re limited in the established length from the receiver to the FSB. Drop-in handguards are also in two pieces so they can fit without removing the barrel, delta ring, or FSB. You also have to make sure you get the proper length for your gas system. 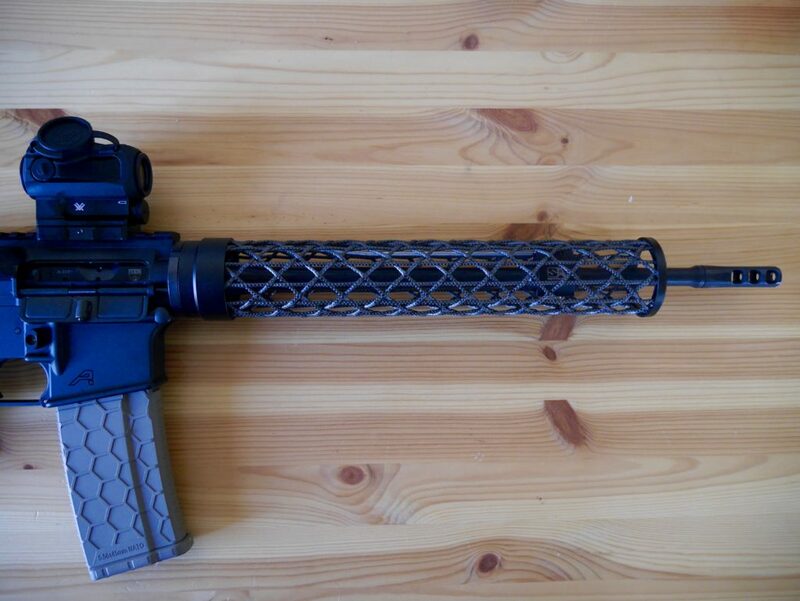 Some AR-15 handguards need to correspond with the right length in order to fit. 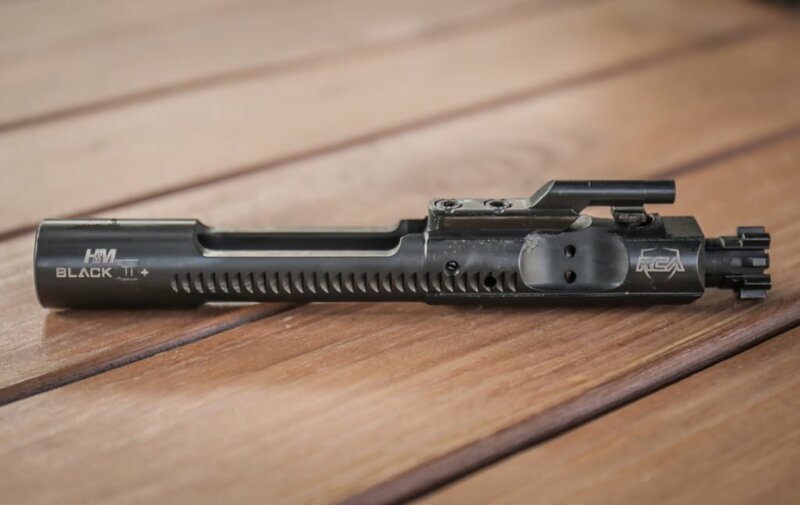 Probably the most ubiquitous drop-in handguard due to their weight, affordability, and looks. Comes in several colors and all the normal gas lengths: carbine, mid-length, & rifle. 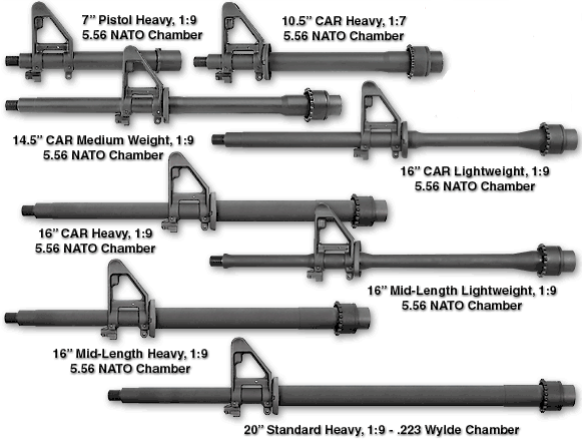 Aluminum rail options for the different gas lengths. Pricier but from a reputable company. 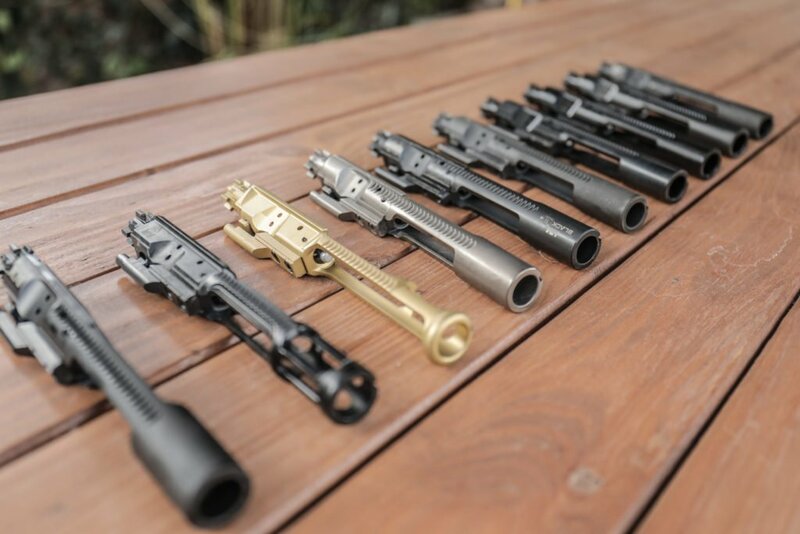 We run multiple versions of their free-float handguards. If you’re looking for a quad-rail system, here it is. Comes in a variety of gas system lengths. 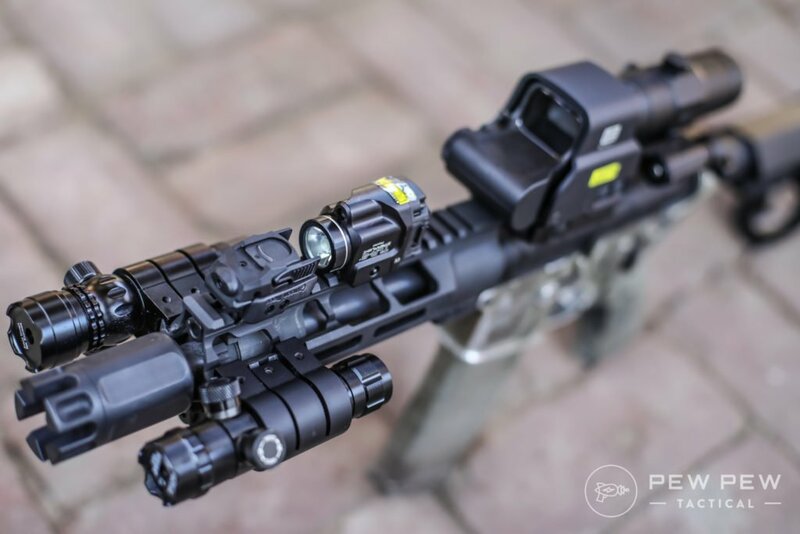 Free-floating handguards connect only to the receiver and do not touch the barrel. This increases accuracy since there’s nothing interfering with the barrel such as the stock, grip, or accessories. 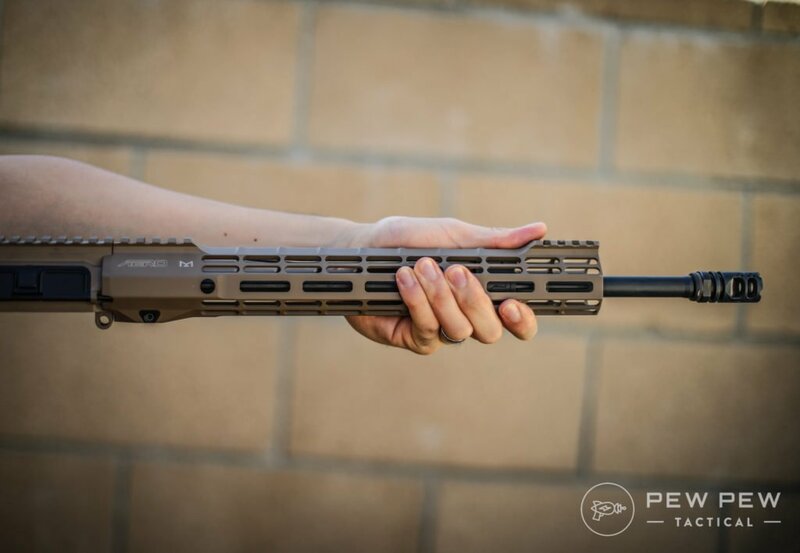 You can also choose the length of your handguard to be much longer to accommodate an extended grip and hang extra accessories. 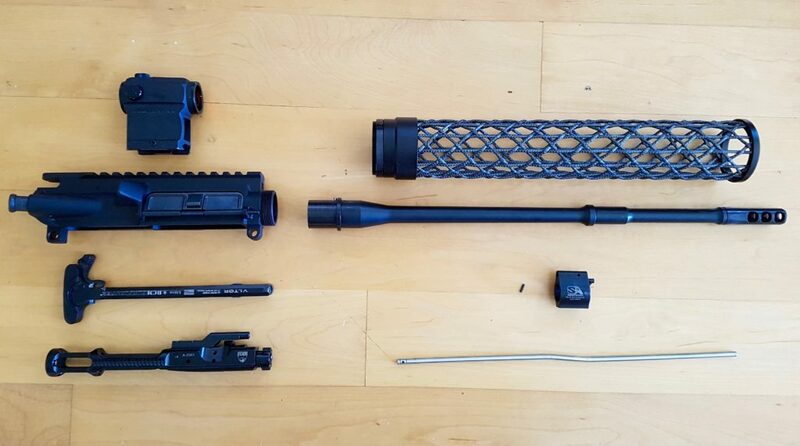 Just be sure to measure your barrel + muzzle device so you order the right length handguard. 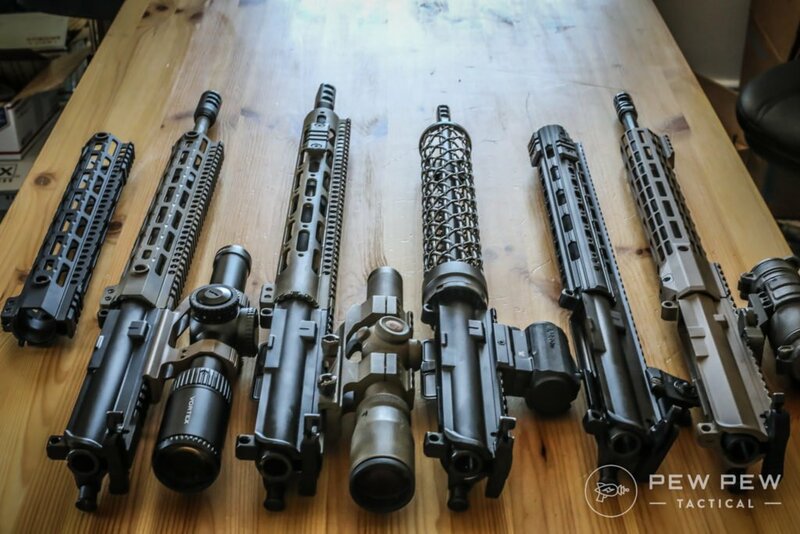 My personal recommendation is for a 12″ or 13″ handguard which will give you enough space for almost any arm position. Plus, I prefer M-LOK over KeyMod. Looks like US Special Operations Command (USSOCOM) agrees too. The trend is moving towards just Picatinny rails on the top instead of quad-rails (all around) to reduce weight. And then just adding on rails where needed for flashlights, grips, etc. Again, here’s a few of our top choices. 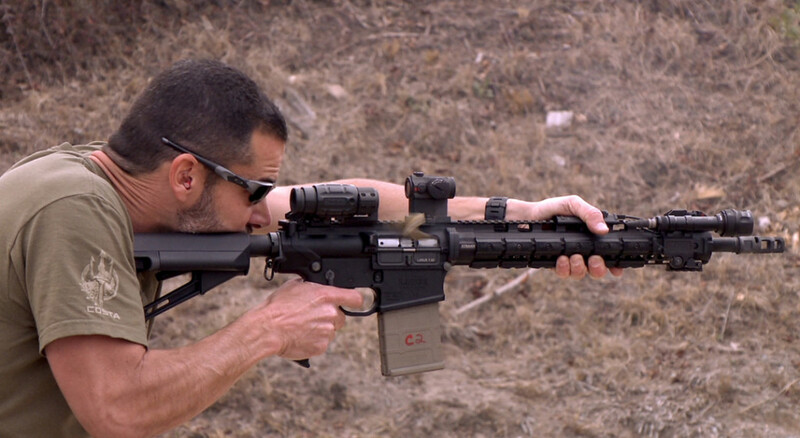 For more see our Best AR-15 Handguards article. My current favorite due to the weight savings from the removal of the top Picatinny rails. Plus the front taper perfectly fits my thumbs. Here it is on an Aero upper I love (full review). My favorite handguard that is featured in Best Lightweight Handguards. Comes with 8 sides of M-LOK attachment capability. 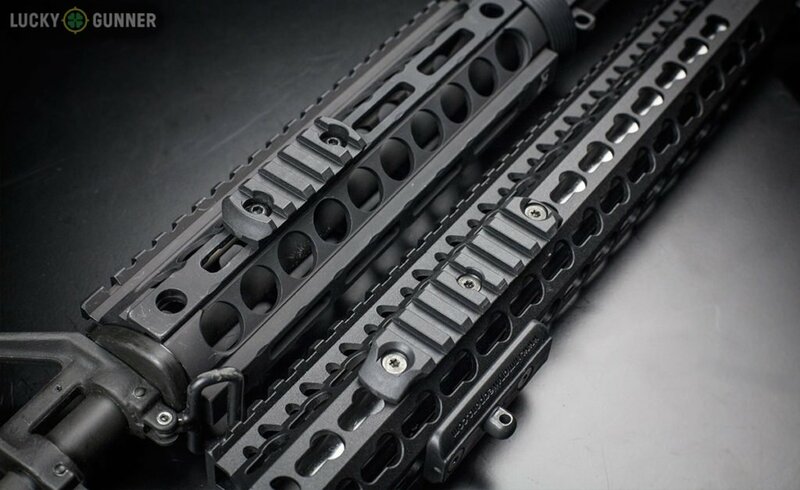 If you’re still looking for a quad rail…YHM has got you covered. A little heavier but you get tons of real estate to put anything your heart desires. The full rail version of my favorite Midwest handguard. One-piece design that comes with a super slim 1.5″ outside diameter and detachable rails. What we run in two of our primary guns (two left-most complete uppers). Literally, the lightest I’ve ever felt…and still plenty strong. But you gotta pay to play. 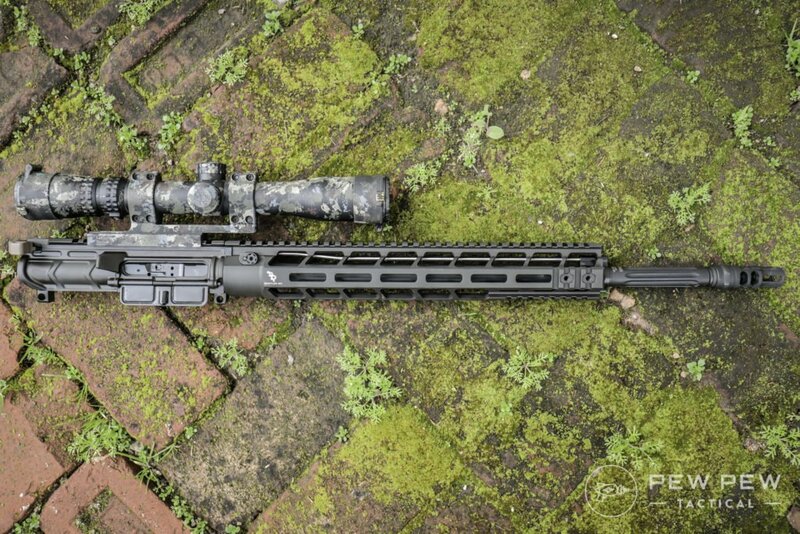 Winner of the Lightest Handguard roundup. 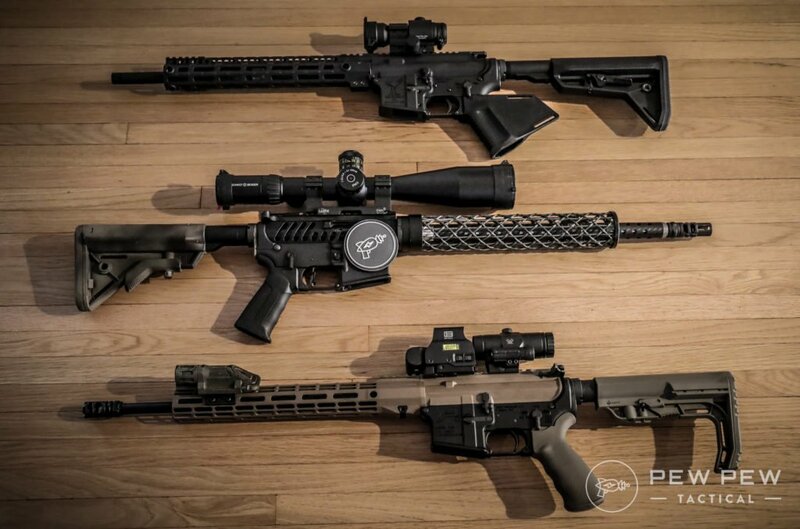 For everything handguard, check out our Best AR-15 Handguards article. 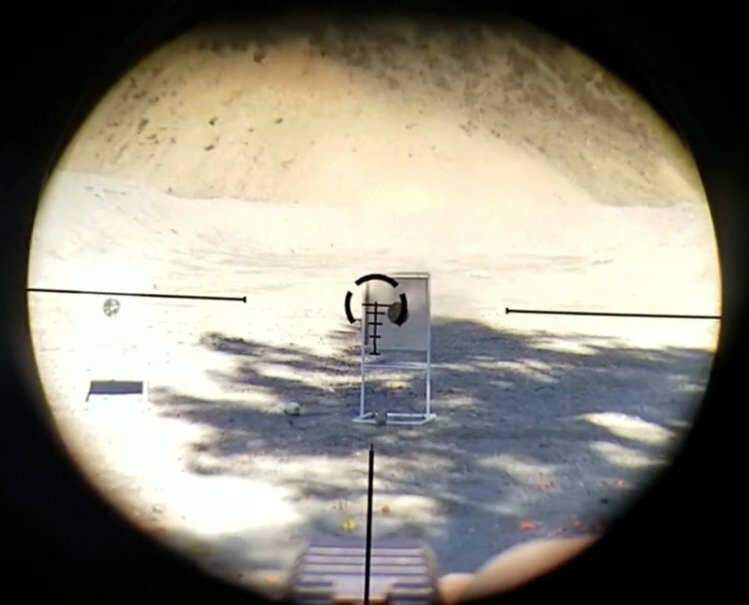 Whatever BCG came with your rifle and has run fine, will likely continue to run fine. 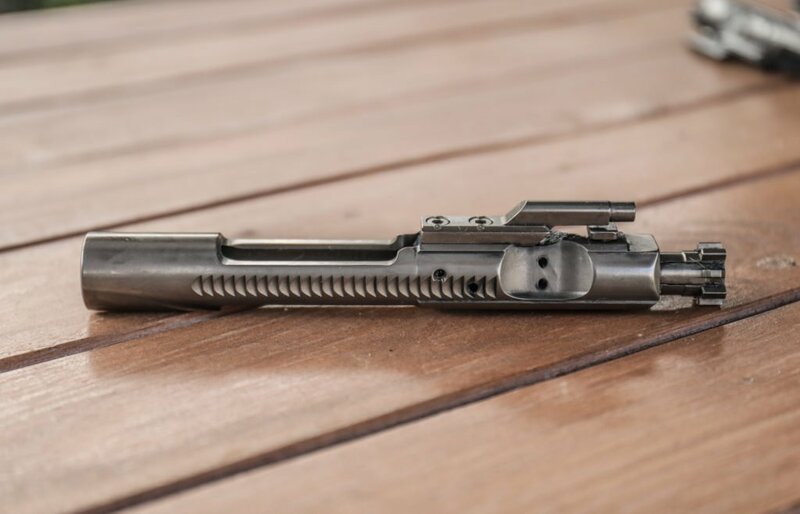 But if you’re dead set on fixing something that isn’t broken, or if you’re building a new rifle…check out Best AR-15 BCGs. You can take a look at new coatings or lighter weight profiles for BCGs. Here’s a couple of our favorites. The go-to for mil-spec that will always go bang. If it’s a duty or self-defense rifle I suggest going with a BCM. Want something slicker and easier to clean? Plus the silver looks much cooler showing through your upper. This is what I’d use for a budget build. The phosphate coatings are a little bumpy but they’ve always gone bang. This one is a double threat. Lightweight to go with an adjustable gas system for less recoil..remember the BCG is a big hunk of metal moving in your gun. And if you’re upgrading…might as well go with a different coating. 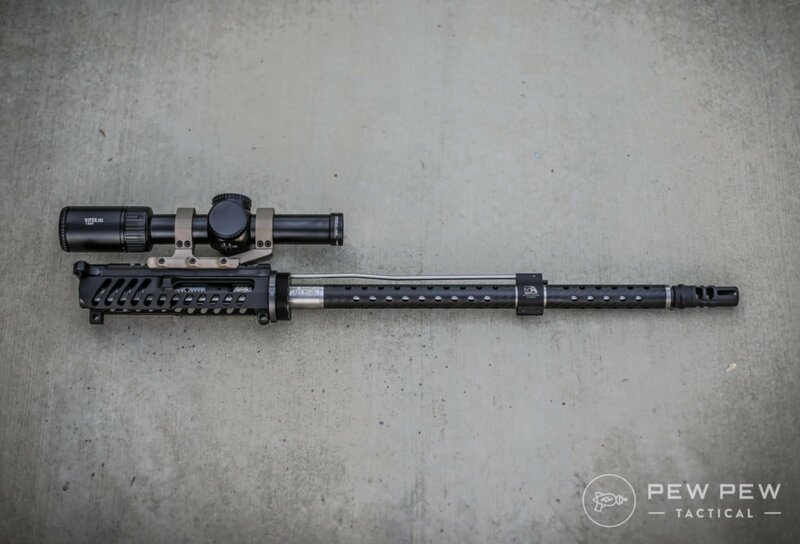 Want the same BCG profile but still the weight savings? I use the RCA Titanium BCG in my race gun for reduced recoil. Check out the rest of the BCGs we love in Best AR-15 BCGs…or go straight to Best Lightweight BCGs for you competition shooters out there. One of those upgrades that you were fine without…but now that you’ve experienced it…you wonder how you could have ever done without. Every one of my serious rifles has an upgraded charging handle for easier and more robust bolt manipulation. See the whole batch in Best AR-15 Charging Handles. 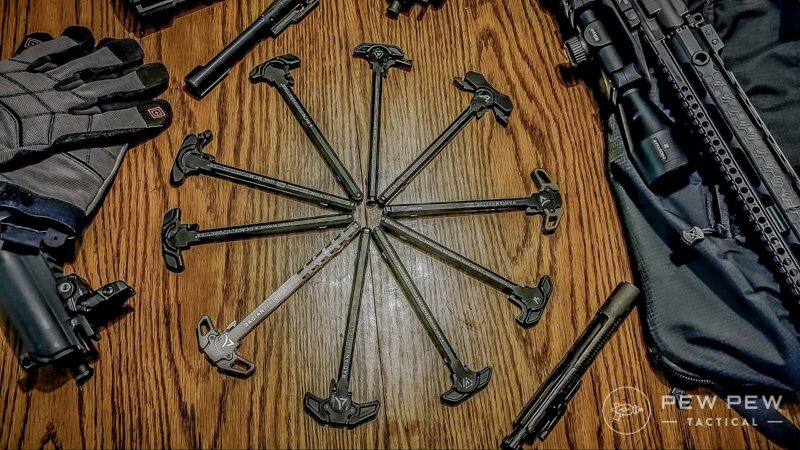 The OG and one that goes on every one of our competition/defensive rifles. 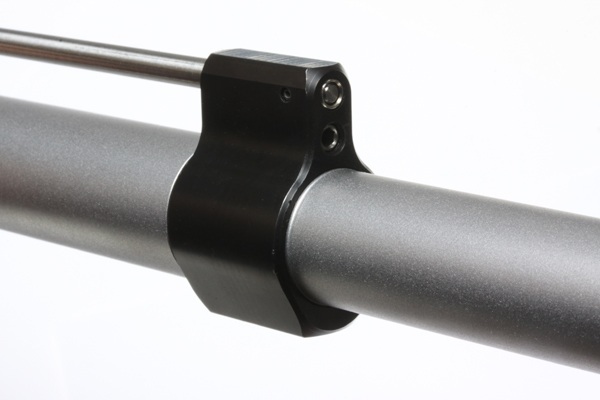 Makes it much easier to rack the charging handle without worrying about flex or premature wear. We’ve tried the cheaper options of just switching out the latch, but it just doesn’t feel as robust. We go for the medium size Mod 4 for the balance of ease-of-use and potential to snag. The most robust and smoothest ambi charging handle out there. But it will cost you. 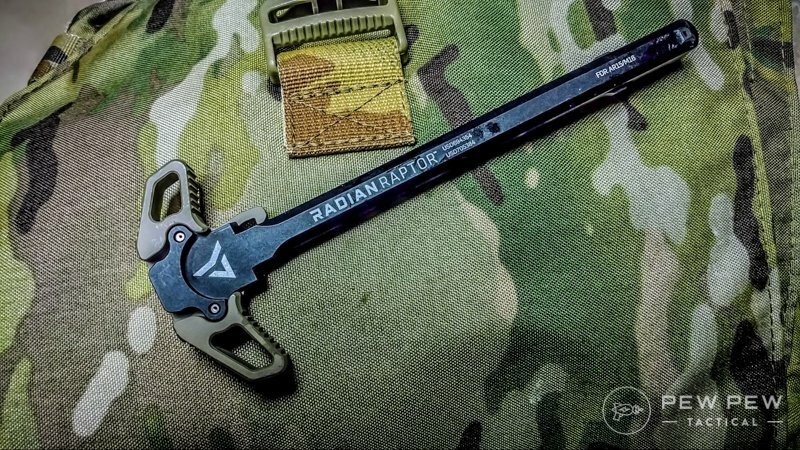 A newer kid on the block…this is the “light version” of the ambidextrous Raptor. More affordable and lighter. Especially useful if you’re a lefty or like to use your right hand to brass check. Only a couple bones more than the BCM and you upgrade to ambidextrous controls. 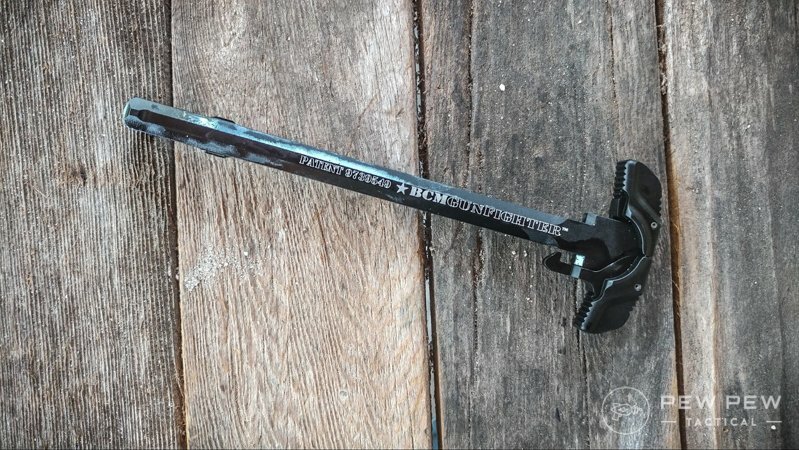 We cover a bunch more charging handles for affordability and even for suppressed use in Best AR-15 Charging Handles. Overwhelmed yet? We’re almost done! You might consider a barrel upgrade if you’ve worn out your barrel or if your current profile/length isn’t up to par for your purpose. Or you’re doing a new build! For more accuracy-related tasks, you might consider a heavier contour which makes the barrel stiffer and more resistant to accuracy drop-offs due to heat and barrel whip. If you’re wanting to reach out farther, you might consider a longer 18″ or 20″ barrel for that extra boost in velocity. Stainless steel barrels are also known for being more accurate but at the expense of a shorter life (and more expense). 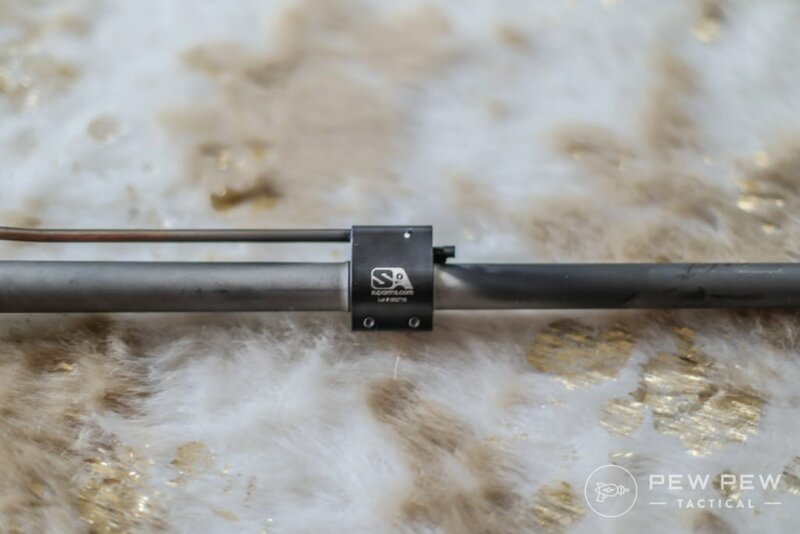 Or if you’re looking to cut back on weight and looking at sub-300 yard distances, you could go for a lightweight profile and drop to the standard 16″ or even 14.5″ with a pinned muzzle device. And for critical use rifles, we would suggest both MP/HP tested barrels for that extra margin of safety. For those looking for a softer shooting AR-15, you could look for a longer gas length, such as moving up to mid-length from a carbine. The extra length gives more space/time for gas pressures to lower before cycling back. 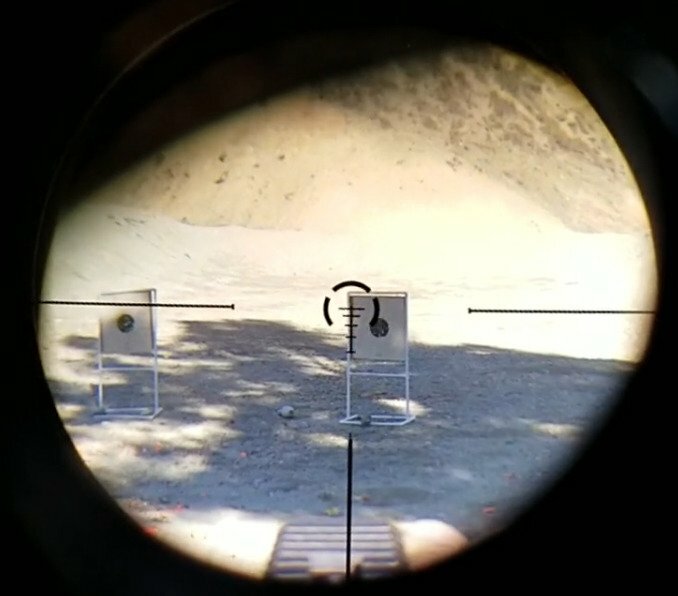 Faxon Firearms: My go-to barrel manufacturer with accurate, affordable, and specific Gunner profile. Made in-house with their aerospace manufacturing background. Great across the board for 16″, precision, short, and other calibers. Ballistic Advantage: Another in-house manufacturer that has a proprietary Hanson profile that reduces barrel whip. Currently in my competition rifle. Also great for other calibers. 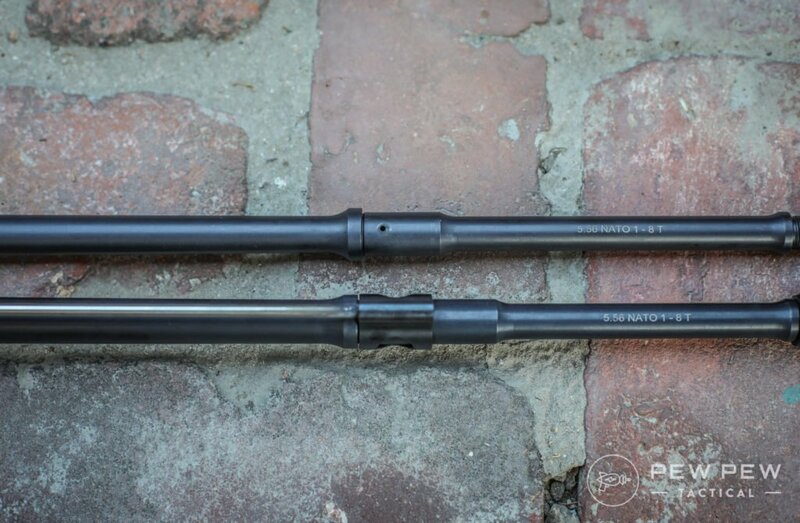 Again…for a lowdown on everything barrel…check out our Best AR-15 Barrels Guide. 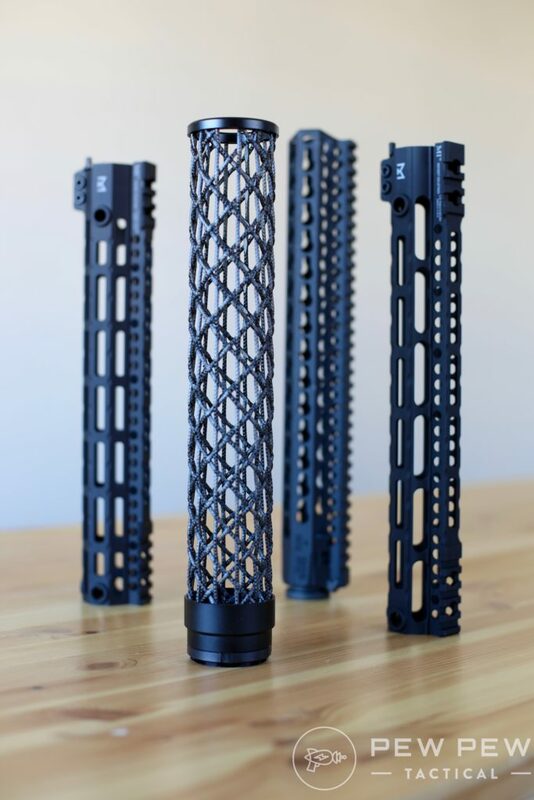 Having a low profile gas block allows you to put on a free-floating handguard which unlocks better accuracy and more rail space for your grip and accessories. Some gas blocks will also be adjustable so you can tune your rifle to your specific ammo to create a softer shooting AR. 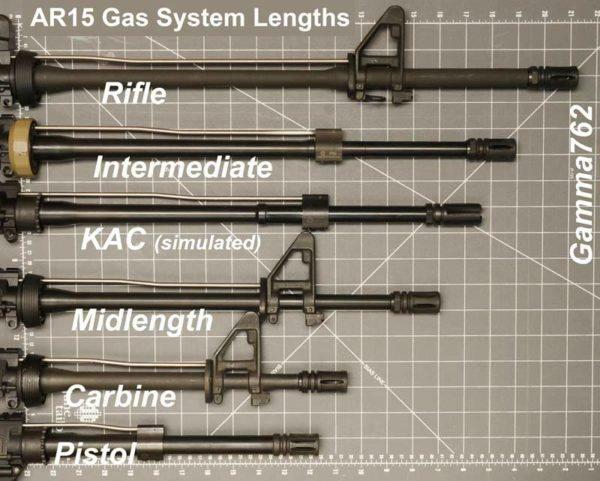 Be sure to match up the diameter of the gas block to your barrel profile. Light profile is .625″, normal is .750″, and heavy profile is .936″. Also make sure to have the appropriate length gas tube if you are not reusing your old one. 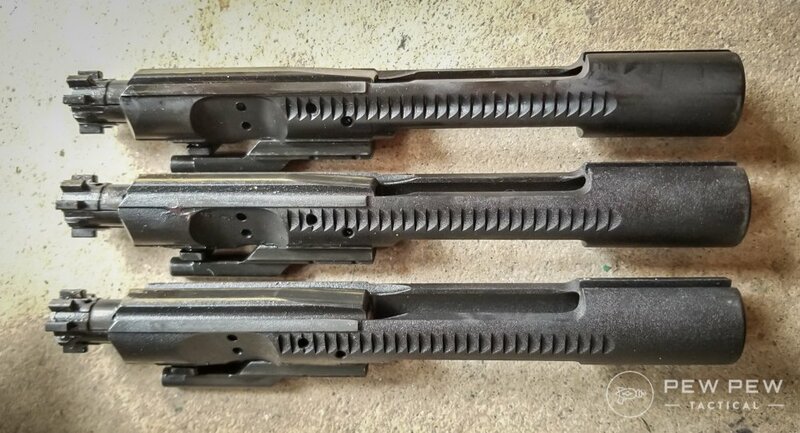 If you have a front sight base barrel, it is extremely difficult to remove and can result in a bent barrel if done improperly. We recommend taking it to a gunsmith or just shaving it down yourself to have a makeshift low profile gas block. 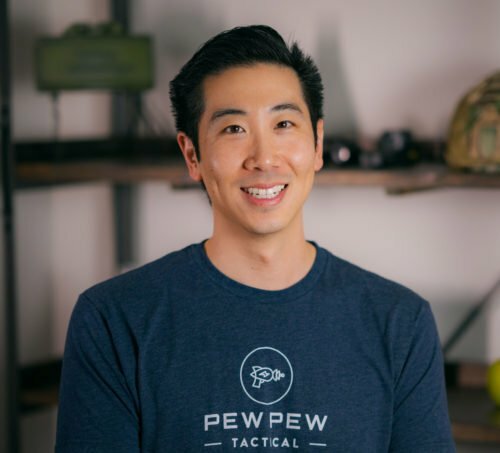 Daniel Defense: They do what they are supposed to do and stay on. 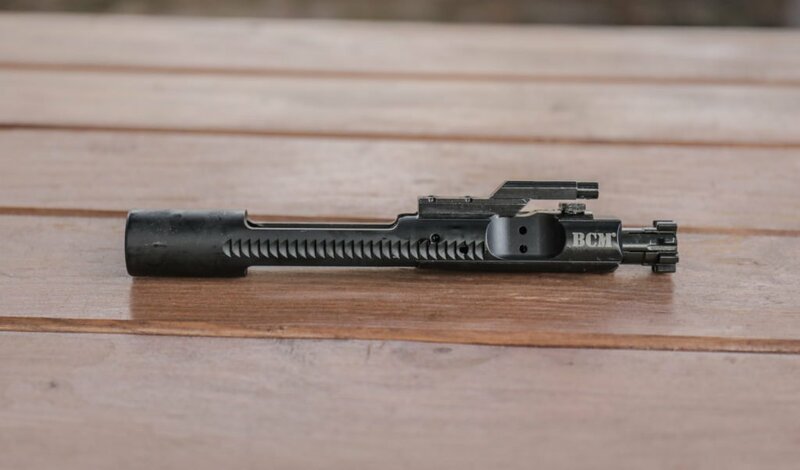 JP Industries Adjustable Gas Block with Rails: This one is not low profile so it allows a shorter handguard but still has the ability to attach accessories on the rails. Bravo Company Low Profile Gas Block: Another heavy duty low profile gas block for pencil and regular barrels. 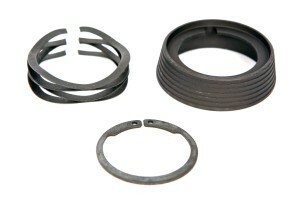 Seekins Low Profile .750 Adjustable Gas Block: We love that it has a set screw to lock in the adjustments ($56). Hard to keep in stock, here are other adjustable gas blocks. Superlative Arms Adjustable Gas Block: My new favorite because you can easily adjust without taking off your handguard plus it bleeds the excess gas forward instead of all over the place like other adjustable blocks. For the lefties out there or for poor Californians running “featureless” AR-15’s who need to be able to flick their safety on the right side. 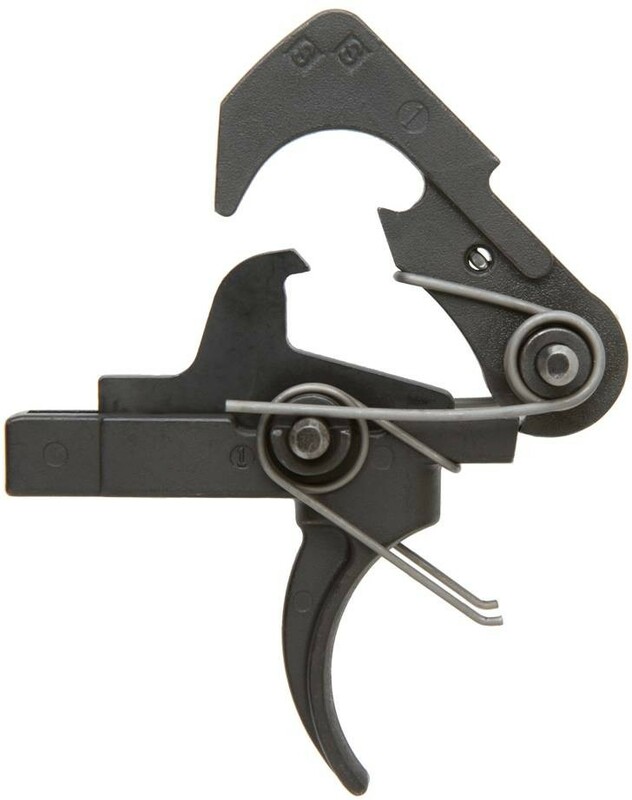 Lower profile safety lever on the right side that won’t interfere with right-handed shooting. What we run in our competition guns. A more budget-minded version that still gets the job done. Or if you’re looking for some flair and quality. Plus these work the best with Featureless AR Builds. That should get you through most of the major upgrades for the AR-15. But there’s still tons of things to upgrade! If you’re planning on upgrading a lot…you might be better off building your own. 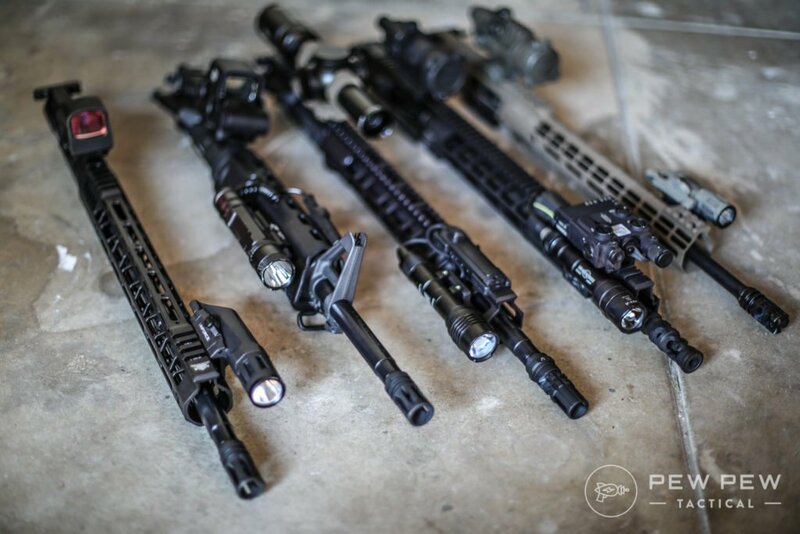 Check out how with our AR-15 Resources Page. I always value your input on what works best, and have used your guidance on many component of my AR, even if it is a 6.5 Grendel. Now I’m expanding my inventory and pushing into more powerful calibers. 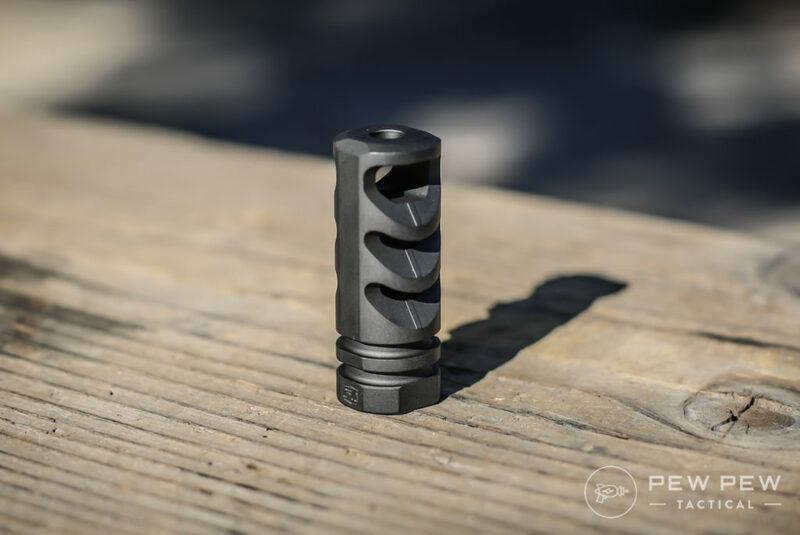 Would you still recommend the PRECISION ARMAMENT muzzle brake on a 300 Win Mag? you left out Stngr. They look great, easy to install…and the price. It makes for an awesome Handguard. I have The Hawk. killer look. Agreed! Amazing handguards made right here in Texas! I just got a BCM RECCE kmr-a 16. Swapped out the BCM comp for a VG6 Epsilon and cage. Took out the PNT trigger group and dropped in CMC single stage 3.5 flat bow. Run them in all my rifles. Added BAD lever, BCM kag and veritcle grip, Magpul MS4 sling, Vortex Strike Eagle 1x8x24. Thank you for all your emails and internet content. Have learned so much from you folks and trust your opinions. I wonder if the HABU by Falcon 37 is an unknown out there, it if it just isn’t well received. I run these in 3 different builds and I love them, as does my son and son in law. I think it’s at least with a look. 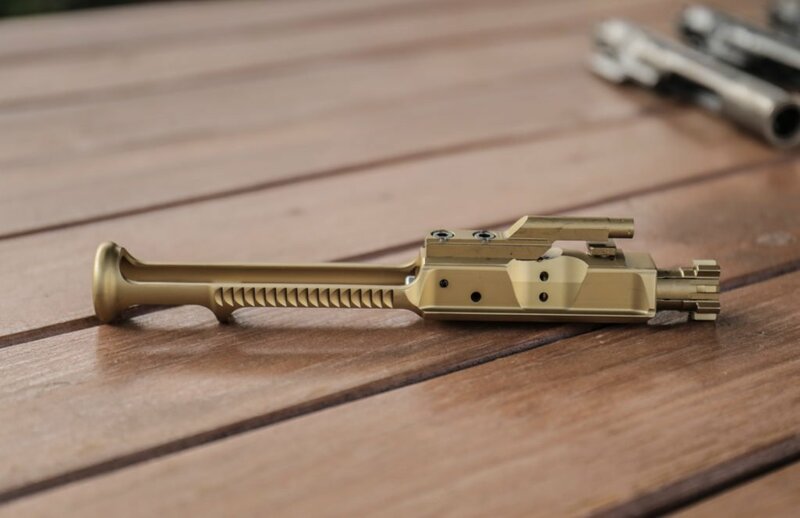 There are a few brands offering basically the same thing, a charging handle that works more like a pistol slide. As far as I’ve seen, none of them have ever really taken off. 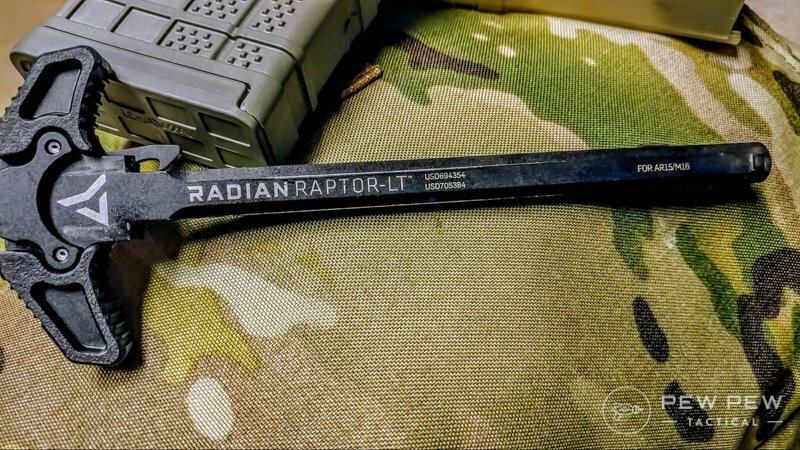 I don’t find them to offer anything over a more standard charging handle, maybe better than milspec but not better than a Radian or Geissele charging handle. I’d be interested in using one more extensively though! I would love in the future put together an AR and would love your assistance in do so. I will surely bookmark this page and site. Thanks.